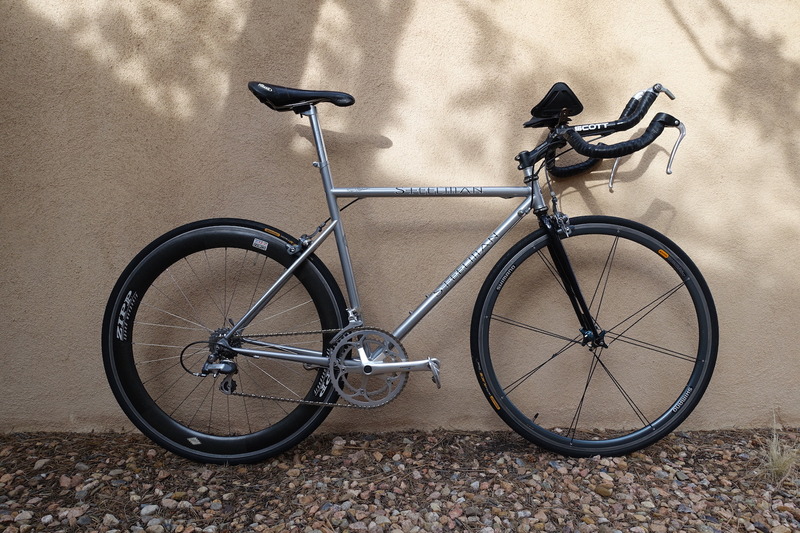 This entry was posted on April 12, 2019 at 8:47 am and is filed under Bike stuff. You can follow any responses to this entry through the RSS 2.0 feed. You can leave a response, or trackback from your own site. Can’t remember ever being young, was never fit but threw one or two, and the last number I wore was on a placard I had to hold under my chin when the sheriff took my mug shots. I can’t really remember being young or fit, but I smoked a few numbers, which probably explains the memory issues. Wow PO’G. That gives me lower back pains just looking at the drop and stretch/reach. What a beautiful frame though. The angles and symmetry are spectacular. I personally prefer the front Shimano wheel…..nice style points on the spokes. Were they more aero that way? Other? I’ve missed a few posts…..what’s your total “rideable” bike count? It’s really not as bad as it looks, JD. I dunno if I could hold that position for 40km, but then nobody is asking me to. That Shimano wheel is from way back, when everybody and their granny was diving into the weirdo-wheel market. I think the set I have is the Ultegra version of the pricier Dura-Ace model. No idea what they were intended to do beyond making money for Shimano. The fleet now contains 15 rideable bikes, and I’ve ridden ’em all in this edition of the Ride Your Own Damn Bike Festival®. Herself has two, but she hasn’t ridden either of ’em lately. I’ve got a pair of those Shimano Ultegra wheels. Nice, but a pain in the saddle. The trick is to find a set of tires loose enough to fight their way onto the rims. I went through three sets of tires before finding a set that did not require me to break tire levers and pinch inner tubes while installing them. It was the Vittoria Open Pros that worked (the Michelin Pro 3s and Vittoria Rubino Pros were impossible) and I don’t actually like laying down that many dead presidents for tires any more. I keep a set of Open Pros on my nicest set of wheels for the Six-Thirteen. Every other wheelset gets what is on sale. I have an old pair of 700×25 Continental UltraRaces on mine. I tried mounting a newer 700×32 Conti Gatorskin to the Zipp but no way in hell was it going on without tire levers and a lot of bad language. Contis have gotten really snug lately. Young, fit, and wearing a number….yep…somewhere around 1990 or so. Egad. thank you for the tour. i came late to cycling (50+) and only did randonneuring at that. now riding the brevets with equivalent of the grandkids..but i can daydream on your bikes. Welcome to the nuthouse, Silas. I’ve always ridden a bike, except for a short stretch in my late 20s. Didn’t start racing until I was of “master” age, which always struck me as ridiculous. How can you be a “master” of something you’ve never done? Now in my dotage I’m back where I started — riding for fun and for transportation. It’s all good. Ooh ya gotta be made out of rubber to hold that TT position. Does anyone remember the never-got-rolling Greg LeMond Challenge? It was a great idea and I was out hawking it here in Michigan. But the necessary sponsors didn’t pony up and it died quickly. Too bad. Time trailing was huge in England where sissies like me shied away from crits out of fear of losing more skin and shredding the few bike shorts we had. Methinks the tight tire mounting nowadays has gotten out of hand. It’s most likely due to the plethora of rims and their dimensions? Companies making tires just have to find middle ground when sizing and hope for the best. I always liked time trials. Can’t say I was ever particularly good at them, though I won a couple short ones and eventually broke the hour for 40km. You couldn’t be in Kent Bostick’s age group and call yourself a time trialist, though. Now crits, that’s where I really sucked. Truly woeful. Comic, save for the tragic parts. I lacked faith in speed, friction and centrifugal force. Do the tight tires have something to do for the industry’s mania for tubeless everything? What’s so onerous about fixing flats and patching tubes? Your 1 Hour 40K is something to hang your hat on! Truth up POG, wasn’t on the Vespa was it? Hell you were close to turning pro. Living close to a rail/trail I often carry extra tubes to save the clueless from 8 mile walks. I’ve come across two riders last year pushing their tubeless tire bikes. I tried putting a tube in one but what a damn mess and wasted half the time I had allocated for my ride. The second rider I just shook my head and kept moving. Stupid oughta hurt sez I. He had no pump or tire levers so who am I to argue with fate? My buddy says I have to stop being a tire bigot but I call em as I see em. If you need to run your tire pressure so low that you have to go tubeless, maybe you should walk instead and see more of the world around you. Word. I think that tubeless tires are not ready for prime time. They are getting closer, but are no more puncture resistant than clinchers with various puncture protection features. I have experience with helping friends with flats on the tubeless tires. On one I was able to spin the wheel and finally get the sealant to work after two sessions with my pump to ge the pressure back up. The second involved putting a tube in the tire when it refused to seal from a puncture by a drywall screw. I also had to boot it. Not an easy job with leaked sealant all over and very tight beads. Nope, I ain’t going there and I challenge the average rider to tell me how they are better than the best tire tube combos currently available. I gotta start carrying a first-aid kit. On yesterday’s ride I came across a dude who had augured in on a fast, loose, rutted, twisty descent, right into the cholla. His bike was still hung up in the spikes when I saw him and his brother standing at trailside, pulling thorns. Some tweezers would’ve come in handy there, and maybe a couple of alcohol wipes. No real damage, but the guy is gonna be seriously uncomfortable for a while. I broke the hour three times on the Moriarty course, which was about as flat as flat could be. My best time was 56:47 in 1990, but it was hard to get wound up about it when Bostick and John Frey were trading national records on the course. Frey finally settled Bostick’s hash in 1990 with a 47:35.37 — nearly 10 minutes faster than me. John Frey getting set to post a record at the 1990 Record Challenge Time Trial in Moriarty, NM. After looking at that drivetrain, I think I would need a tow vehicle to get started. That frame is a work of art. I can see why there is more than one Steelman bike in your garage. You should’ve seen Frey’s drivetrain. I was still at The New Mexican in 1990, but freelanced a piece about that year’s Moriarty Record Challenge to VeloNews for the Sept. 24 edition. He was riding double discs, with a homemade aero bar (see the photo above); it was a fixie with a 53-tooth chainring and a 13-tooth cog. The Mavic Comete disc has a 12-19 seven-speed freewheel, and with that on the bike, the weight drops to 20.7 pounds. Plus, since the only bar-cons I had left in the garage were seven-speed, with the disc on I can index-shift the sumbitch. Great 2-part interview w/John Frey at PezCycling for those interested in the tech, support (or lack thereof), motivation, etc. in the nineties. Dude was such a hammer. I mean, think about starting a 40km ITT in the 53/13, with a homemade aero bar that basically left you with just enough space to lean on if your elbows were glued together. But one, two, three pumps and zoom, he was up to speed. An amazing thing to watch. I’ve always thought chrono bikes were fast because the awful position encouraged speed….you went as fast as you could so you could get off the f–king thing! If I had a bike that was good-looking in some way but not something I would ever contemplate riding again I’d mount it on the wall or otherwise display it in the house. Back in Iowa we had various framesets displayed atop a bookshelf, including the prof’s custom, made-to-measure Colnago track bike. There’s a spot in the apartment we’re renting in Napoli just begging for a classic bicycle to display….but we ride all the ones we kept! I always found them big fun to ride, as long as the course wasn’t too technical. The hard part was getting schooled by all the geezers who just bolted some geek-bars to their reg’lar road bikes and passed me so fast my aero helmet spun around like a weathervane in a hurricane. I still have one of those bolt on aero bar gizmos from the last century. I think it is Profile Airstrike or something like that. Just to remind me of my hapless days pinning on a number. Somewhere I have my award for taking first place in my age class out at the Makaha TT on Oahu. The weather was dreadful, as it is one of the first events of the year and we were having a winter storm. Turnout was lousy. If you crossed the finish line, you were almost guaranteed a trophy. Which is how I got mine. I had taken a couple years off Riding Hard(tm) after developing a painful case of patellar tendinitis in both knees but I had started commuting 24 miles a day round trip to the University from our newly bought house out on the east end of Oahu. That was actually pretty damn good training for time trialing. Especially the trip home at night straight into the Trade Winds.